very famous Salar de Uyuni. The trails we used were far from recommended for bikes and we spend most of our time at very high altitudes in between 11,500 ft and 16,500 ft. Starting Bolivia by riding in a National park had its advantages and inconvenient and that’s what we are going tell you. In total we ride 435 miles for two weeks in very hostile grounds for bikers. The trails were a mix of gravel, sand, endless bumps, high altitudes and finally salt in the Salar de Uyuni. While riding the national park we spend most of our time in between 12,000 ft and 17,000 ft with a lot of changes in altitude and very uneven range. After the park, while in the Salar de Uyuni we ride most of the time at an altitude of 12,150 feet, which is the average on the Bolivian Altiplano. In term of daily distance, it was hard to bike at our usual rate. We were doing approximately 30 miles a day (see itinerary on the left for details). Nevertheless we are proud to say that we managed to ride 60 miles during one day in between San Juan de Rosario and Laguna Canapa. The Salar de Uyuni is the biggest salt desert in the world. There is no wildlife in this environment but the landscape is unique, especially when you are lucky enough like we did to cross it during the raining season. In the end we could contemplate this place on two different angles, inundate and dry, and we did not spoil our enjoyment! But we cannot say that our bikes enjoyed this region as most as we did, because as you are surely aware, salt and steel don’t get together. It took us two days to cross the Salar de Uyuni and we spend our only night in this region on the island of Incahuasi, a no-man’s-land right in the middle of this region. We froze our feet while walking in 6” of icy water where we could barely walk barefoot on the 3miles crossing. The salt in addition to the freezing water definitely damaged our feet and with the sun reflecting on this immense blank surface we ended up having pretty bad sunburns. Even if the landscape was magnificent, there are some inconvenient that we would have been glad to avoid, especially the cold weather. Because of that we had to pick up more than usual in our budget in order to spend some warm nights while crossing the national park (first time after 9 months in our trip). We nevertheless managed to bivouac in average one night out of two with our equipment more than limited in this high altitude freezing environment. In order to deal with the very low temperature, we had to gather all together in one tent and use of every stratagem to keep the warmth inside. But it is important to remember that you should let a little bit of air circulate through the tent in order not to suffocate during the night. In fact the condensation freeze on the mosquito’s nets and fill the holes … you better be aware of that! 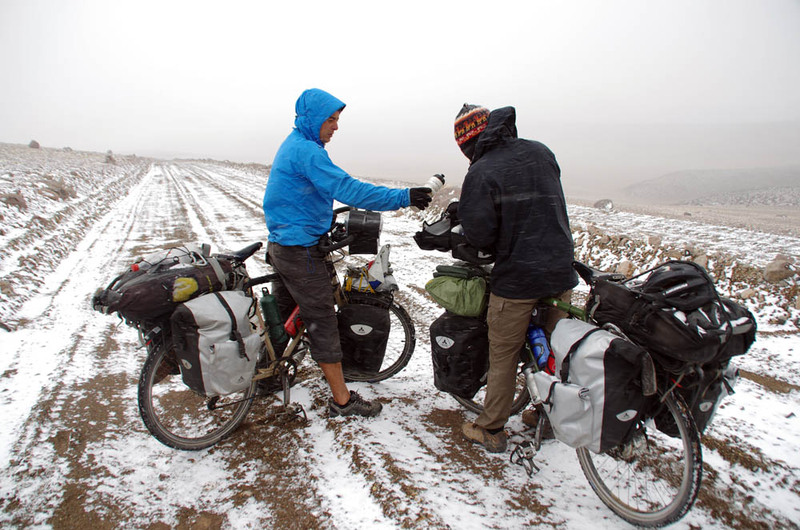 – Our bikes bags full of air were installed all around us to form a barrier in between us and the cold. In the end it wasn’t unusual to find some parts of the tent and our water bottles frozen in the morning. This part of Bolivia is very touristic due to the national park… Now that you know how bad the roads can be, you wouldn’t be surprised that the « Gringos » in SUV are legion in this region. Some of them were being nice when crossing our path, but some were definitely not and showing us that we were not welcomed at all by driving very close to our bikes.